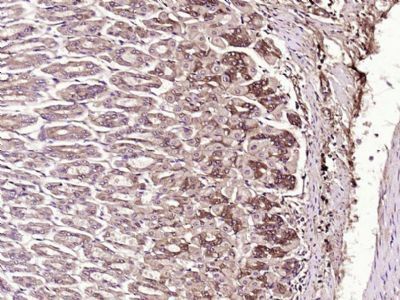 别 名 pigment epithelium-derived factor; Serpin-F1; Stromal cell-derived factor 3; SDF-3; Caspin; Alpha 2 antiplasmin; EPC 1; EPC1; PIG 35; PIG35; Pigment epithelium derived factor; Proliferation inducing protein 35; SERPIN F1; Serpin peptidase inhibitor clade F member 1; SERPINF 1; SERPINF1; PEDF_HUMAN. Pigment epithelium derived factor, originally identified in conditioned medium of cultured human fetal retinal pigment epithelial (RPE) cells, is a neurotrophic protein that induces extensive neuronal differentiation in human Y79 retinoblastoma cells, a neoplastic counterpart of normal retinoblasts. It has been suggested that PEDF is synthesized by RPE cells and secreted into the retina interphotoreceptor matrix where it may influence development/differentiation of the neural retina. PEDF is a potent inhibitor of angiogenesis. As it does not undergo the S (stressed) to R (relaxed) conformational transition characteristic of active serpins, it exhibits no serine protease inhibitory activity. 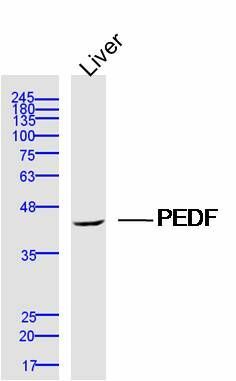 The PEDF gene is a member of the serpin gene family. Serpins are a group of serine protease inhibitors, some of which have also been reported to exhibit neurotrophic activity. Defects in SERPINF1 are the cause of osteogenesis imperfecta type 12 (OI12) [MIM:613982]. 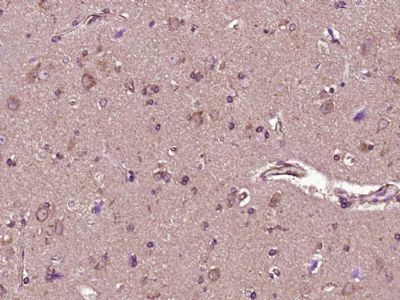 OI12 is a connective tissue disorder characterized by bone fragility, low bone mass, and recurrent fractures. 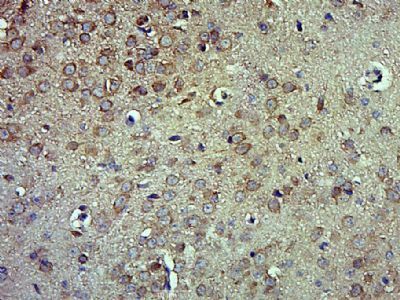 OI12 is characterized by features compatible with osteogenesis imperfecta type III in the Sillence classification. Patients have normal grayish sclerae and fractures of long bones and severe vertebral compression fractures, with resulting deformities observed as early as the first year of life. Paraformaldehyde-fixed, paraffin embedded (Mouse stomach); Antigen retrieval by boiling in sodium citrate buffer (pH6.0) for 15min; Block endogenous peroxidase by 3% hydrogen peroxide for 20 minutes; Blocking buffer (normal goat serum) at 37°C for 30min; Antibody incubation with (PEDF) Polyclonal Antibody, Unconjugated (bs-20784R) at 1:500 overnight at 4°C, followed by a conjugated secondary (sp-0023) for 20 minutes and DAB staining. Paraformaldehyde-fixed, paraffin embedded (Human glioma); Antigen retrieval by boiling in sodium citrate buffer (pH6.0) for 15min; Block endogenous peroxidase by 3% hydrogen peroxide for 20 minutes; Blocking buffer (normal goat serum) at 37°C for 30min; Antibody incubation with (PEDF) Polyclonal Antibody, Unconjugated (bs-20784R) at 1:500 overnight at 4°C, followed by a conjugated secondary (sp-0023) for 20 minutes and DAB staining. Paraformaldehyde-fixed, paraffin embedded (Mouse brain); Antigen retrieval by boiling in sodium citrate buffer (pH6.0) for 15min; Block endogenous peroxidase by 3% hydrogen peroxide for 20 minutes; Blocking buffer (normal goat serum) at 37°C for 30min; Antibody incubation with (PEDF) Polyclonal Antibody, Unconjugated (bs-20784R) at 1:500 overnight at 4°C, followed by a conjugated secondary (sp-0023) for 20 minutes and DAB staining.